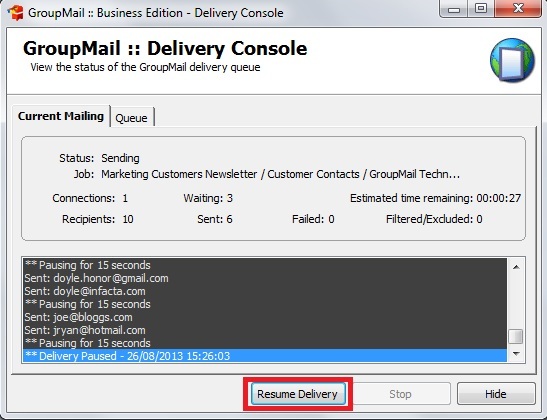 How to Pause my Bulk Email Delivery in GroupMail ? Can I “Pause” my Bulk Email Delivery in GroupMail ? Go to the Tools Menu, Delivery Console. On the Delivery Console, Click on the Pause Button. This will Pause the Delivery of your GroupMail Messages until you Resume Sending later. To resume sending, simply click on the Resume Delivery Button. This will continue sending from where it was paused and send to the remainder of the recipients within your GroupMail Group. If the GroupMail Renewal on your license is expired and you want to download the latest Version of GroupMail you can renew your license by clicking the Extend Cover button in the GroupMail Customers Area.